Today we speak with Melissa Pateritsas of Shaw Industries Group, which uses Google Apps along with Smartsheet. Read on to find out how these integrated solutions foster collaboration and add greater efficiency to the Shaw Industries supply chain. Register here to join our Hangout on Air on July 20 at 10 a.m. PT to learn more about how Smartsheet, a Google recommended app, can improve your business. 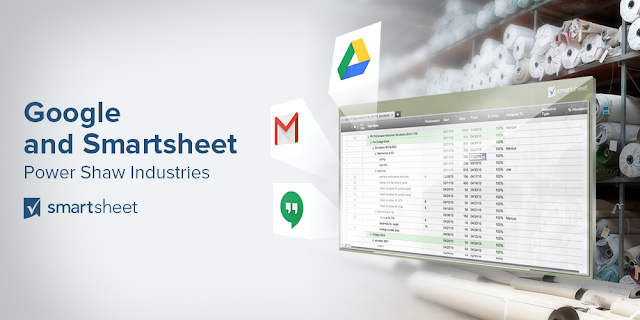 Can you tell us about Shaw Industries and why you chose Google Apps and Smartsheet? Shaw Industries Group is committed to creating an efficient and sustainable supply chain for its flooring enterprise. Being the world’s largest carpet manufacturer and a leading floorcovering provider means sustainability isn’t just a moral or ethical imperative, it’s smart for business. More efficient supply chains produce better, lasting products with fewer costs. With offices and sales representatives across the United States and world, Shaw’s sales reach nearly $5 billion every year. Our growing business needed an even more efficient (and sustainable) way to bring daily operations into the digital age. So we turned to two powerful collaboration tools: Google Apps and Smartsheet. In Smartsheet, we could make good use of the collaborative work management (CWM) platform that marries the power of a project and process management solutions suite to the familiar interface of a spreadsheet. And we saw Google Apps as an opportunity to improve efficiency and collaboration across teams. With a strong working history, the two work in tandem very well and together were exactly what we needed to achieve our digital transformation. You mentioned the importance of supply chains for Shaw Industries. How did considerations around the supply chain impact your decision to switch to Google Apps and Smartsheet? Part of creating an efficient and sustainable supply chain is lowering overhead costs. The processes used to produce carpet and flooring at our various manufacturing facilities differed slightly from location to location. The many manufacturing divisions had common needs, but also their own unique challenges. Any solution would have to address these differences, while commonalities would cause overlap. It didn’t make sense to have different support teams for each process, especially if half of what the teams did was identical. Sharing plans and projects was also challenging. The systems we had in place were costly and time-consuming. We needed a way to increase visibility and update project statuses, not only for our team, but also for external parties like clients and vendors. What results are you seeing now that you’re using Apps and Smartsheet? Turning to Google Apps’ collaborative tools was a positive first step. Google Drive allowed us to easily share documents and files both internally and externally. Documents could be instantly shared and jointly edited by employees around the world in real time. Plus, going paperless made our operations more ecologically friendly. Smartsheet’s suite of project and process management solutions, which feature Google Apps integration, further enhanced what Google already had to offer. Smartsheet offers great flexibility. With them, we can easily create templates that we can edit and customize to meet diverse needs. We also simplified project roll-ups — which were previously done by hand. Using cell linking, engineering managers could automate the process, saving time and effort, and automatic updates solved the problem of visibility that we struggled with. We could now easily share individual projects with stakeholders, both internal and external, ensuring that everyone was on the same page. Also, today our separate business units are able to build custom and individualized solutions on a strong foundation that addresses both common and distinct needs. Managers and engineers can automate processes that had previously been done by hand, spending more time and energy on devising ways to make our products better and longer-lasting. These new solutions are built using familiar interfaces and services that employees already know how to use. Can you tell us about the process of adopting Smartsheet? Adopting Smartsheet was a simple transition because of its familiar spreadsheet-like GUI. We didn’t need additional software. Everything we needed could be done within the frameworks that Google and Smartsheet already offered. So where does the company stand now in terms of its digital transformation? We’re definitely in the midst of transformation. With Smartsheet and Google solutions, and their simplicity and the scalability that a worldwide enterprise like Shaw needs, we’ve reduced overhead and complexity and cut time spent on processes. We now have more time and focus on building for the future. We can also proudly say that we’ve met our goal to create easy-to-adopt digital practices and a more efficient, sustainable supply chain.